We are a prominent manufacturer & exporter of Wooden Jambee Drum. Made of premium quality wooden materials these musical instruments are designed in proper dimensions and crafted with beautiful designs. These instruments are also panted with various bold colors drawn in traditional as well as modern patterns. Punjabi Dhol made from Steel Sheet with with superb welding. Size available 11" to 15" diameter & 17" hieght. Also as per your requirement. Backed by our affluent industry acquaintance, we present a comprehensive series of Wooden Bhangra Dhol. 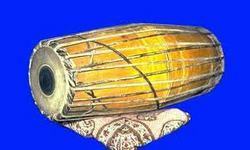 Dholak is a side drum, cylindrical in shape, bored out of solid wood. Its pitch is variable and is an essential accompaniment for folk music of North India. Deluxe model. Wooden two-headed drum. Deluxe model. Wooden two-headed drum. Heads held in place and tuned by bolts. Held horizontally, both heads are played. In India, these extremely popular percussion instruments are commonly used in folk music and during marriage ceremonies. 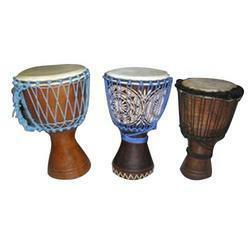 We are the reliable exporter and supplier of dholak fyber made. We have in store for our clients, excellently crafted dholak drum, which is reckoned for its musicality. Dholak, which is one of the most popular folk drums, is immensely used in northern India. The most striking feature of these drums is that they have simple and smooth heads on both sides.